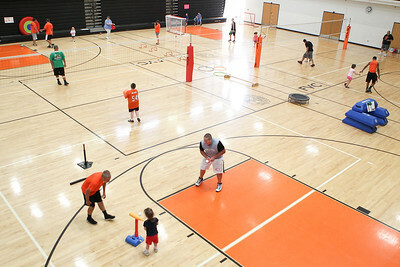 The third annual Sports Day was held Saturday, July 14, 2012 at McHenry East High School in McHenry. Mike Greene - mgreene@shawmedia.com Mandie Polizzi, 4, bows after receiving a medal following the third Annual Sports Day with GiGi's Playhouse Saturday, July 14, 2012 at McHenry East High School in McHenry. 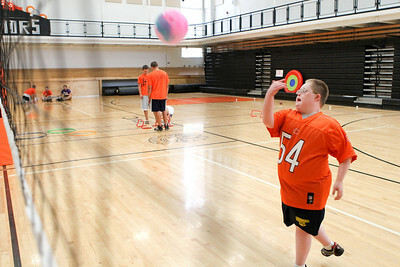 Members of the MHS football team were paired with special needs children and family members as they participated in various athletic activities. Mike Greene - mgreene@shawmedia.com Jake Braskett, 17, provides support to Angelica Pesavento, 7, as she hurdles over a bar during the third Annual Sports Day with GiGi's Playhouse Saturday, July 14, 2012 at McHenry East High School in McHenry. Members of the MHS football team were paired with special needs children and family members as they participated in various athletic activities. Mike Greene - mgreene@shawmedia.com Members of the McHenry High School football team were paired with special needs children and family members as they participated in various athletic activities during the third Annual Sports Day with GiGi's Playhouse Saturday, July 14, 2012 at McHenry East High School in McHenry. Mike Greene - mgreene@shawmedia.com Nate Rueckemann, 17, helps read over a certificate for participation with Brogan Hora, 7, during the third Annual Sports Day with GiGi's Playhouse Saturday, July 14, 2012 at McHenry East High School in McHenry. Participants received a certificate and a medal for taking part in the day's events. Mike Greene - mgreene@shawmedia.com Nik Bauer, 15, helps Mandie Polizzi, 4, hit a ball off a tee during the third Annual Sports Day with GiGi's Playhouse Saturday, July 14, 2012 at McHenry East High School in McHenry. Members of the MHS football team were paired with special needs children and family members as they participated in various athletic activities. 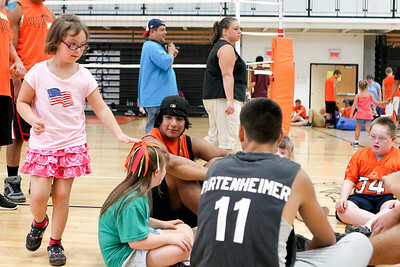 Mike Greene - mgreene@shawmedia.com Angelica Pesavento, 7, plays Duck, Duck, Goose with a group during the third Annual Sports Day with GiGi's Playhouse Saturday, July 14, 2012 at McHenry East High School in McHenry. Members of the MHS football team were paired with special needs children and family members as they participated in various athletic activities. 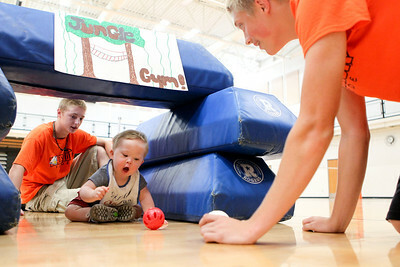 Mike Greene - mgreene@shawmedia.com Andrew Fugatt (left), 15, and Scott Marunde, 15, play with 18 month-old Will Personette during the third Annual Sports Day with GiGi's Playhouse Saturday, July 14, 2012 at McHenry East High School in McHenry. Members of the MHS football team were paired with special needs children and family members as they participated in various athletic activities. Mike Greene - mgreene@shawmedia.com Brandon Hagy, 12, hits a ball over the net during the third Annual Sports Day with GiGi's Playhouse Saturday, July 14, 2012 at McHenry East High School in McHenry. Members of the MHS football team were paired with special needs children and family members as they participated in various athletic activities. 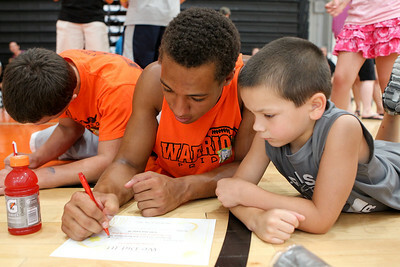 Mike Greene - mgreene@shawmedia.com Jake Braskett, 17, fills out a participation certificate with Gavin Hora, 6, during the third Annual Sports Day with GiGi's Playhouse Saturday, July 14, 2012 at McHenry East High School in McHenry. Members of the MHS football team were paired with special needs children and family members as they participated in various athletic activities. 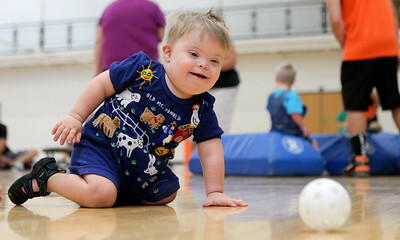 Mike Greene - mgreene@shawmedia.com 22 month-old Lukas Sanders crawls after a ball while playing during the third Annual Sports Day with GiGi's Playhouse Saturday, July 14, 2012 at McHenry East High School in McHenry. Members of the MHS football team were paired with special needs children and family members as they participated in various athletic activities. 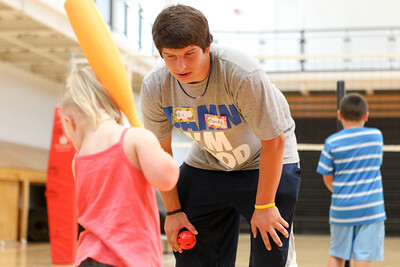 Nik Bauer, 15, helps Mandie Polizzi, 4, hit a ball off a tee during the third Annual Sports Day with GiGi's Playhouse Saturday, July 14, 2012 at McHenry East High School in McHenry. Members of the MHS football team were paired with special needs children and family members as they participated in various athletic activities.